Hi there I’m Adrian Ainsworth (Beastie) and my wife is Chrissie Gates (Peanut) and this is our blog all about cars and specifically the adventures we have had with our own cars. Beastmaster.co.uk is our main site, or front page if you like and we have a number of satellite sites specialising in particular areas. These are PhotoBeast, WatchBeast, AutoBeast and Friday Cool, which are our quartet of websites designed and run by ourselves Beastmaster and Peanut, to enable us to share our interests in Photography, Watches, Cars and Gentlemen’s Style. Additionally we have a number of visual websites that display walls of photographs. iBeastie On The Fly allows us to blog on the move on any random thing that catches our eye and it also displays photographs from PhotoBeast and AutoBeast posts. Then we have a Wall of Watches which feeds primarily from WatchBeast and we have a Friday Cool Wall which displays photos on the theme of Gentleman’s Style. Last but not least we have the Gentleman’s Page which is a stylish wall of Beautiful ladies with beautiful cars. All our site blogs stream into The World of iBeastie window on the Beastmaster.co.uk front page. Running side by side with the frivolity of our passions is The Life Blog, which maps out the battles and campaigns of Beastie in his personal war with the Big C since July 2010. AutoBeast is a mish mash of occasional car reviews and motoring news, write ups of car events we have attended and on going features such as our Car of The Week. it will also showcase the adventures we have had with our own cars. PhotoBeast was born out of our Project 365 (a picture a day which builds into a fascinating pictorial diary), and has been reinvigorated by our purchase of a Fuji X-E1 camera which has quite simply just put the fun back into taking photographs. 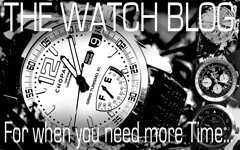 WatchBeast began with My Journey Through Time (a look at all the watches I have in my collection) and has continued with a Watch Blog reviewing watches that catch my eye and highlighting some watches I don’t have but would like!